Deuter Futura 28 SL Hiking Backpack For Women presented here is a new 2018 model with a modified suspension system. It comes with a bonus rain cover and a bottom compartment. Deuter Futura 28 SL pack for women. Trampoline-style tensioned mesh for ventilation. This Deuter Futura 28 SL is a completely new version launched in 2018. The big difference as compared to the previous Futura packs is in the tensioned trampoline mesh on the back. They have added a breathable foam along its sides and this then continues seamlessly to the lumbar padding and to the hip belt. You will see the same design also in the Deuter Futura Vario packs, see for example this Futura Vario 50 + 10. I have been using these packs for 15 years and I am not completely sure that this is better as it is now, but it definitely looks cool and very advanced. Namely, this design reduces the total mesh surface on the back, so the ventilation should be reduced as well, but it adds more support and cushion; though the question is if you really need it, my feeling is that the mesh was enough. This is a top-loading pack with a classic lid and collar. But, this relatively small pack has also a bottom compartment with a divider between it and the main compartment, see the picture below. Note that here you have a real divider with a zipper, so nothing can slide from above to the bottom section. You can open it though, and have the whole space as a single compartment. The bottom sleeping bag compartment with a zippered inner divider. There is a sleeve in the main compartment for a 3-liter reservoir (which is not included), so the pack is fully hydration-compatible. 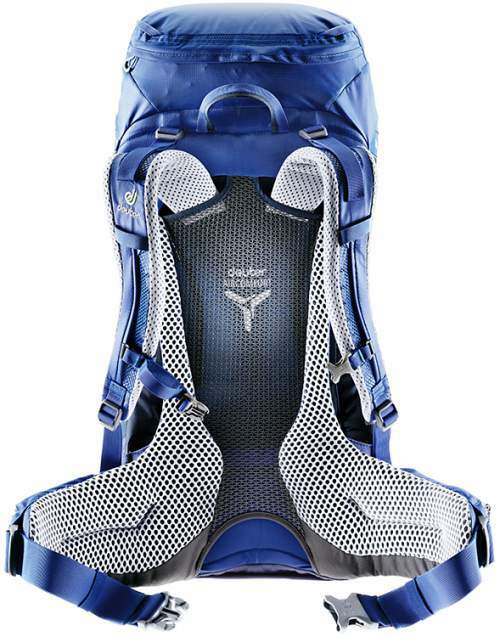 Capacity-wise, this is a 28-liter pack, with lots of attachment elements and pockets for organization. So it is perfect for day hiking tours or even overnight tours in huts. Note that you have rain cover included, so your stuff will be safe regardless of where you go, it is stored in a specific zippered bottom pocket, this is the same in all Deuter’s packs that come with a rain cover. Gender-wise, this is a women-specific design, and this is why they use the letters SL in the name. So this is the “slim-line” with some features introduced to fit a woman’s body, like a narrower harness, a differently profiled hip belt padding and fins, different padding on the harness, smaller and softer buckles, etc. Weight-wise, with its 3.13 lb (1420 g) of weight, this is not a lightweight pack. This is not surprising in view of its steel frame and massive padding. Compare this with the Osprey Mira AG 26 which is also a bit heavy with 1.18 kg. So if the weight is your main concern better check some ultra-lightweight packs like this Mountainsmith Scream 25 which weighs only 0.58 kg but it is without a frame, or Osprey Tempest 30 which weighs 0.85 kg. This is the best part of the pack. As mentioned above, this is the best ventilation you can have. This trampoline style system was invented by Deuter and introduced somewhere in 1984 in this same Futura series, so now you know how this system appeared. They call it the Aircomfort Sensic system with the patented 3-side ventilation that decreases perspiration by 25% (they claim this is certified by the Institute Hohenstein, Germany). The tensioned mesh for the best possible ventilation. Note that the torso length is not adjustable. It fits the size of 14 – 18 inches (36 – 46 cm). You still have the usual elements for adjustment which you see in the picture above, and those include also the load lifters straps and an adjustable sternum strap. They write of what they call the Active Comfort Fit, which should mean that the shoulder harness straps are attached in such a way that they adjust to the user’s shoulders shape and size. I have just had the backpack in my hands and do not see anything like that. The attachment of the shoulder straps to the back panel is not rigid, but there is nothing like self-adjustment of any kind. I am hopeful that they might react if by any chance they see this text. Going to ask them about that. The padding is incredibly well-done here and very massive for such a small pack. All this is supported by a durable spring steel frame that provides stable tension for the mesh. What you see on the hip belt is the ergonomic Comfort Lock system with dual density foam for a custom fit and the best possible load stability. Frankly speaking, it looks too massive for such a small pack. Observe also the lumbar area with the ventilation channel and mesh in the central area. On the font, you have the pull-forward system to easy fasten and tighten the belt. There are 8 pockets in total. Those include two in the lid, one on the top and one underneath it. Two zippered pockets are on the hip belt, two stretch mesh pockets are on the sides, and one large stretch mesh pocket is on the front. Completely on the bottom, you also have the pocket for the rain cover. On the sides you have dual compression straps, so you can use them to fix items carried in the side pockets or to cinch the pack. Four attachment loops are available on the lid, so here you can attach anything, like a solar panel or a pad. Note that there are no compression straps on the bottom compartment, pity. Two loops for the poles are on the front and paired with bungee tie-offs higher on the pack. A carry handle is between the shoulder straps. Very reliable and strong construction. A bit heavy (by numbers only). If you get a chance to have this pack in hands, you will realize that it does not feel heavy at all. I just tried it and was puzzled with its official weight. Weight: 3.13 lb (1420 g). Volume: 1709 in³ (28 liters). Dimensions (H x W x D): 25.2 x 11 x 8.7 in (64 x 28 x 22 cm). Torso fit: 14 – 18 in (36 – 46 cm). Hip belt fit: up to 53 in (135 cm). This table clearly indicates what is behind the weight, there are big differences in the features of these three packs that are in the same size range. 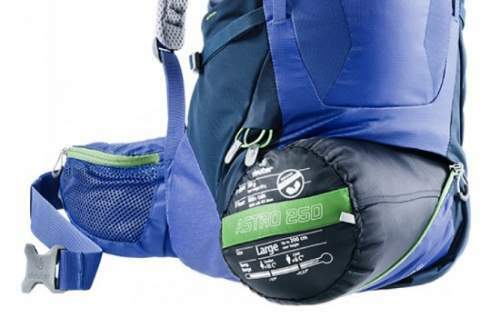 The padding and the hip belt construction of the Deuter’s pack is the main reason for its weight. Please follow the links to read more. So the Deuter Futura 28 SL Hiking Backpack For Women which you have here is a typical Deuter’s product, incredibly durable and comfortable though a bit pricey. Regardless of what you carry in this pack, you will do this comfortably, the padding is excellent and the ventilation system at its best. I can fully recommend this pack. It is included it in my list of best day hiking backpacks for women. Note that they have this Deuter Futura 30 pack for men with similar features. If you still need more options, please check my page with packs below 35 liters, many packs from top brands are presented in detail. Check this Deuter Speed Lite 22 SL and Speed Lite 30 SL which are also women-specific packs but much lighter. See also this Deuter Futura 24 which is a new version for men.